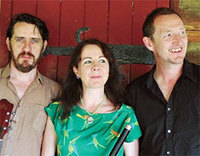 The group, made up of ex-Solas member John Doyle, flautist, singer and songwriter Nuala Kennedy and Eamon O'Leary, are all world-class musicians in their own right, and have now come together to produce a sumptuous and beguiling album which fully represents all of the fire and skill of the group's constituent parts. The songs, both Irish and British songs in English and one Irish song ("Cha Tig Mor Mo Bhean Dhachaigh") find Doyle and Kennedy's voices intertwining to fantastic effect. The album follows in the traditions of Irish song and singers, but very much with its own feel, and the band members have clearly put into it what is important to them, and the strengths, both of the songs and the performers, is clear. The playing is forthright and sympathetic, and the tunes exciting, dynamic, intricate and beautiful - especially "Geese In The Bog/Covering Ground." The story of the album is equally fascinating. The three musicians gathered in the village of Coolaney to conceive the idea of the album, but it came into being in a cabin in the Appalachians. This is a conscious nod to the impact that Irish music has had, and continues to have on many different forms of American roots music. The Alt have put together an album of beauty, care and precision, a distillation of the power of modern traditional Irish music, with a unique American angle. Enjoy the album, and make sure to check out The Alt! Click HERE to order the album!